Somali refugees wait to undergo a documentation process at Dadaab. The lengthy nature of some of Africa's wars is one of the main hindrances to ending the "refugee cycle". Where conflicts drag on over a long time, the future of refugees becomes highly uncertain. They may be forced to stay in a host country for as long as a generation. Under these conditions, refugees often lose the means to become independent. The Somalia war for instance, is over 27 years and the Democratic Republic of Congo (DRC) - particularly the regions of South Kivu, Kasai and Tanganyika - has been in conflict since the 1990s. 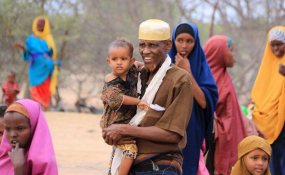 The UN Refugee Agency reported that there are over 870 000 Somali refugees in neighbouring states and over two million are internally displaced. Another factor that makes it difficult for refugees to leave host countries or settle independently is the loss of their migration networks. These are the social networks which help inform migrants on how to get to safety and cope once there - and also how to return home once conflict has ended. Ideally, the voluntary return of refugees to their homelands not only marks an end to their suffering in foreign lands, but also relieves the host country of many burdens. Voluntary repatriation is also critical for the return of sustainable peace because it's difficult to plan for long-term peace without including the needs of the displaced and securing their involvement. After an end to the civil war in Sierra Leone in 2004, for example, the UN refugee agency successfully completed a three-year repatriation operation of over 178,000 Sierra Leone refugees. Much of the post conflict reconstruction that has since occurred in Sierra Leone, Uganda and Rwanda wouldn't have been possible without the repatriation of millions of war displaced. It's therefore crucial for humanitarian agencies to address the issues that make it difficult for displaced persons to voluntarily return home.